Originally uploaded by Henrik & Barbara. Today we ended up at a really local restaurant, serving Chicarrones, which is a typical plate consisting of boiled corn, whole fried Andean potatoes and lots of pork ribs with lime. We were sitting on second floor and had a good view of the restaurant. The place was full. We could see the locals enjoying their food, - couples, kids from school, a local Indian woman and her friends, young families with kids. The feeling we got at the restaurant was a sensation of being bystanders to a play where everything else where moving in a different pace than ours. All the impressions of Peruvian music, locals speaking together, the smells from the grill, the atmospheric interior, made the moment – Like flies on the wall we sat for more than an hour, sucking in the culture. That’s what travelling is about. So now we are in Cusco… In contrast to the restaurant experience, the first impression we got of Cusco was mildly speaking poor. The taxi-driver who told us 5 soles to get to the centre of the city, said 5 soles per person, when we arrived, which we of cause refused to pay. After this we went out to find a hostel, which brought us through the heart of Cusco and thus dozens of people who wanted to sell post cards, food, puppets, hats, ponchos, day trips, permit to take photo of a traditionally dressed Peruvian woman or child with a llama (did you notice the spelling Luis Rodolfo? ), sun glasses, maps, - not to mention the people who wanted us to go to their café or restaurant. The impression was that Cusco is the ultimate tourist nightmare. Now, we have been in Cusco for a couple of days and therefore had time to take a look behind the touristy surface of Cusco. We have had some great walks in the city and together with the restaurant experience and a big dive into the Incas World we have become quite fond of the city. The many small streets with the unique Inca walls, which display the Incas architectural and engineering skills, are spectacular. The Incas was superior in many ways due to their way of building houses, temples etc. 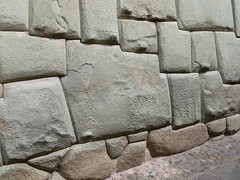 Where many colonial and newer buildings have been destroyed in earthquakes, the Inca structures stand undamaged, even though they used a technique where they made the walls by fitting huge rocks WITHOUT using mortar or other binding material, yet the result of the constructions quality is that you cannot stick a needle in between the rocks. Really neat! Apart from the City centre being plastered with Inca walls and foundations, it also holds one of the most important Inca temples named “Qorikancha”. It is said that the place used to have a whole garden, where everything from the butterflies and snakes to the corn plants and trees was made of pure gold! Also the huge wall which surrounded the temple was covered with thick gold plates. Of cause – this was before the Spaniards melted it all into barras and shipped it to Europe. Today the temple is combined with a Dominican Monastery, build by the Spaniards to manifest the superiority of the Christianity. It is quite impressive the way the two buildings works in junction with each other with the colonial arches in top of the Inca walls - though a complete Inca version would have been prefered. Why we call it The Puma? The Incas had a way of shaping all their cities into things important to them. For example is Machu Picchu shaped like an Andean condor if you see the city from above, and Cusco is shaped like a puma. Ever been kissed by a sea lion?